Lacto-fermented carrots and garlic. Photo by Ashley Kennedy Photography. How often have you been told that fresh food is the most nutritious? Well, I hate to break it to you but this is yet another black-and-white nutrition rule that does not hold true. For millennia, cultures all over the world have been including fermented foods in their diets and benefiting greatly from breaking the ‘fresh-is-best’ rule. Not only do fermented foods add intricacy to your palate, but they also have some unparalleled nutrition properties and allow you to enjoy the bounty of the harvest all year long. If we get down to the basics, fermentation is the process of converting carbohydrates (or sugars) into organic acids and alcohols, using microorganisms such as bacteria and yeast. 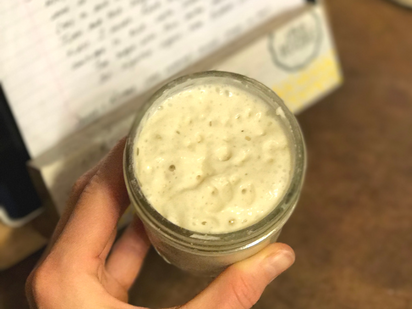 Even though it sounds quite scientific, I also like to think about fermentation as an art – a way to be creative and expressive in the kitchen! Kefir - a fermented dairy product. Photo by Alison Marras. Kombucha is a fermented sweet tea (typically black or green) that is often flavoured with herbs or fruit. To make kombucha you need a SCOBY (also known as a Symbiotic Culture of Bacteria and Yeast), which you can either acquire from a fellow kombucha-brewer or grow yourself with some kombucha and a bit of time. This lightly carbonated drink tastes quite tangy, but can be sweetened by shortening the fermentation time. I like to enjoy it cold after a satisfying meal. Kefir is a fermented dairy product, distinct from yogourt and buttermilk. It is made from fresh milk by adding 'kefir grains' (little gelatinous granules of dairy colonized by bacteria and yeast) and letting the mixture sit at room temperature for about 24 hours. When the lactose in milk is fermented, it creates a slightly sour flavour and thickens the milk to a consistency like thin yogourt. I prefer plain kefir, but you can also sweeten it a bit and add some vanilla or cocoa powder. Try kefir in a smoothie or drizzle it on granola. My sourdough starter - ready to be used to make bread. Sourdough bread is made entirely using wild yeast. The only two ingredients you will need besides water are flour and salt. The whole process starts by making a sourdough starter, which is simply a mixture of flour and water left at room temperature to culture the yeast naturally present in the flour and the local air. (Don’t worry, I was skeptical at first too…) To strengthen your starter it needs to be fed with fresh flour and water over a few days until it gets bubbly and smells somewhat sour. You can then use it to bake a loaf of bread – I enjoy my sourdough toasted with butter or slathered with pesto! Lacto-fermented vegetables are made by submerging any vegetable in salt water, adding your choice of seasonings (I am a big fan of peppercorns and whole garlic cloves), sealing the jar, and letting it sit for 2 (ish) weeks or until you achieve your desired tang and texture. The trick is to completely submerge your veggies in the brine to remove all the oxygen! The lactic acid bacteria that create these fermented treats work best in an anaerobic environment. Now who can honestly say that vegetables are boring? You’ll be eating them right out of the jar.